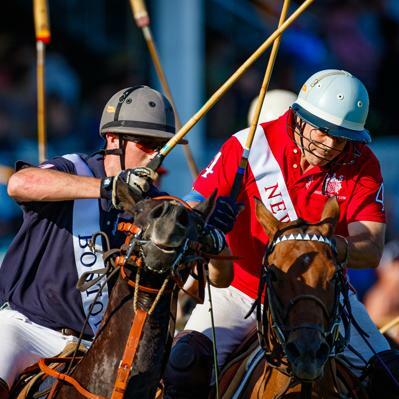 Edge of the seat action between the highly competitive Newport and Boston teams ended in a thrilling finish on Saturday, June 23rd, 2018, in the first City Series face-off of the NBC10 Newport International Polo Series 27, presented by BMW. Newport eventually pulled away in overtime to close out Boston 7-6, and hoist the perpetual trophy for the 6th time, sending their opponents back to The Hub empty-handed. The national anthem followed the introduction of players. Wearing blue for Boston in the #1 position was Alison Poor, with Steven Burr at #2, Nick Snow at #3, and Whitney Ellis & Estani Puch alternating at #4. Representing Newport in red was Sam Clemens in the #1 position, with Charlie Bullis at #2, Dan Keating at #3, and Rory Torrey at #4. Bullis kicked off the first chukka with a goal for Newport to put his team up 1-0, but Poor immediately responded for Boston to end the first chukka in a 1-1 tie. A similar pattern met the teams in the second chukka, as Torrey gave Newport another one goal lead 2-1, but not for long, as Burr responded for Boston to end the second chukka in another tie 2-2. Boston began to pull away in the third chukka, as Burr and Snow gave their team a two-goal lead 4-2 to end the first half of the match. Newport came out strong in the second half, as Bullis and Keating tied the match 4-4 in the fourth chukka. Bullis and Keating continued their charge with two more goals in the fifth chukka to put Newport in a two-goal lead, 6-4. Boston's Snow fired back at Newport's four-goal streak with two individual goals of his own, tying the match 6-6 at the end of the sixth chukka, which forced the teams into a sudden-death seventh chukka. Only a few minutes into overtime, Torrey sealed a win for Newport with his second and game-winning goal to end the match. During the match, a lucky man from Boston, Massachusetts won a magnum of Veuve Clicquot Champagne in the weekly door prize drawing. An extravagant tailgate party in space 74 wowed the judges by their decor for a celebratory wedding shower. The supporters dressed in their finest attire, and decorated their tent with streamers to celebrate their friends. The guests even brought a couch, table, and chairs to enjoy the exciting match from their tailgate party. Specialty vendors and concessionaires were present in the Hospitality village at the polo grounds, and included the Twisted Pony Cocktail Bar, Horseshoe Wine Bar, Newport Polo Pro Shop, Flint & Flame and gourmet food trucks. After 7 chukkas, the match concluded with the Veuve Clicquot Champagne Toast & Trophy Presentation, as well as an autograph signing to meet the players. The Commnder J.B.L. Leavit perpetual cup was presented by Michelle Michaud, Marketing Manager of Brahmin.